Are you comfortable with the way you look? Have you tried every workout program out there and quit after a few weeks? Well, I have the answer for you! 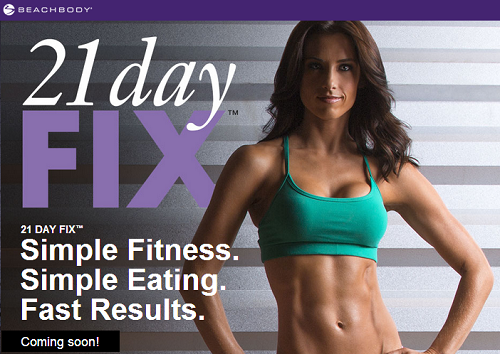 Beachbody’s New Workout- 21 day Fix is the ultimate solution to achieve spectacular results! Check out all of the details below! Meet Autumn Calabrese-National Bikini Champion, NASM and AFPA certified, fitness and health expert. A great motivator and health enthusiast, she will help you to achieve your goals with ease! 21-day Fix is comprised of 7 workouts that are 30-minutes a day for three weeks to give you amazing results! What’s new with this workout? Autumn Calabrese keeps the workouts simple while teaching you a portion control system. In this workout, equal importance is given to your nutrition, since 70% of your eating habits contribute to your results. You receive portion controlled containers for all of your food! And you even get to leave room for a little piece of dessert! This is program is about creating a long term fix! 21-day Fix Reviews indicates that everyone can jump into this workout, no matter what their current fitness level! Lose up to 15lbs and embrace the new, healthier you in just 21-days!